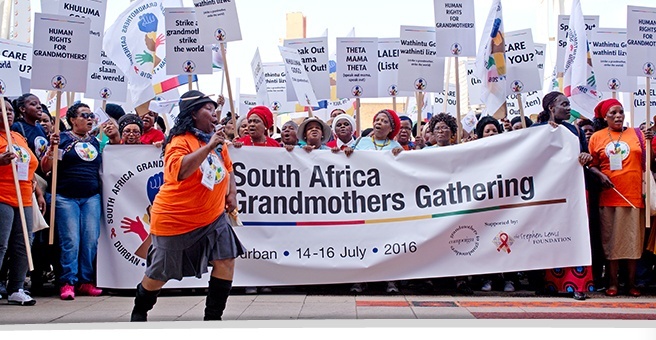 From Thursday to Saturday, 14th to 16th July 2016, three hundred grandmothers from across South Africa participated in an unprecedented National Grandmothers Gathering in Durban. 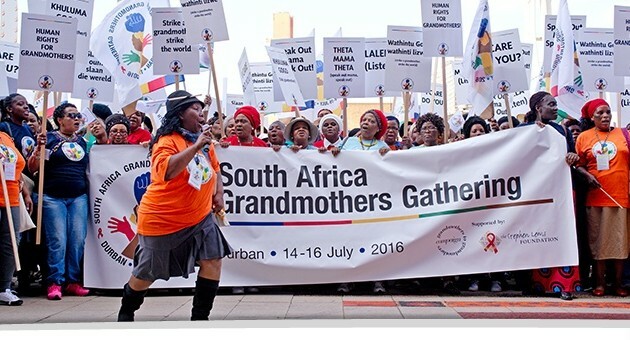 On the final day of the Gathering, they were joined by nearly 2,000 additional grandmothers, to participate in an historic march and to present their Statement—the South Africa Grandmothers Statement! And we are not alone. Grandmothers across Africa have been gathering for the past ten years. From Canada, to Swaziland, to Uganda and now in South Africa, we have moved from mourning to a movement. We have been doing our part, and have become experts on how to survive and thrive in the midst of the AIDS pandemic. It takes so much more than ARVs to resurrect a community. South African grandmothers spent two days together in Durban as the world prepares for the International AIDS Conference, 2016. Today we come to insist that we receive increased support and to have our expertise counted. The first of its kind in South Africa, the South Africa Grandmothers Gathering follows similarly historic convenings in Toronto, Canada; Manzini, Swaziland; and Entebbe, Uganda.